i was preparing to works when suddenly i felt the apartment shaking like so shaky! i can hear the sound of the washing machine and the roof shaking heavily. all of my cats are running toward me. i guess they are scared too just like me. i got panic for a while and try calling my sister. she's waiting for me in the car. at first i thought it was the building that was going to fall off and the first things that was in my mind is to get all of my cats and run downstairs- if i can even make it. i don't even realize the cat's cage was already in my hands until the tremor stop. few second after that i receive a whatsapp group text in KB that tremor has happened there also. that's when i realize that i just experienced tremor. 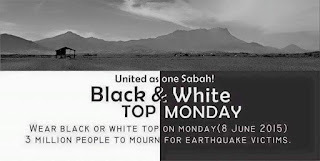 6 Sabahan, 1 filipino, 1 china national, 8 singaporean and 2 still missing. and my heart breaks when i saw the victim faces,especially the Singaporean student today. they are so young to be gone. too soon. may God bless their soul and give strength to their family. 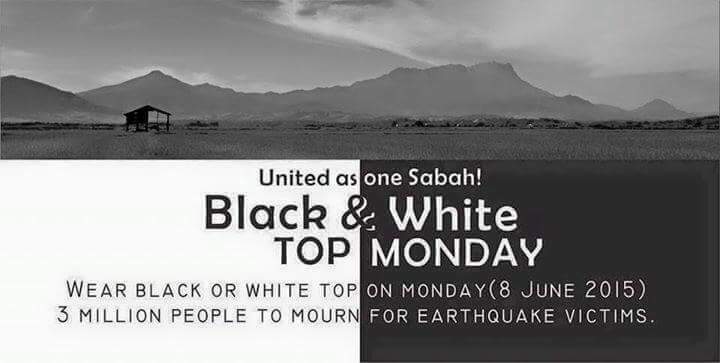 Sabah government has announced today as the official day of mourning for the earthquake victim. May God bless all those who've involve in this tragedy. P/s, will update about the sunset music fest tomorrow.